You may remember that at the end of last month, I went to Hamburg in Germany? 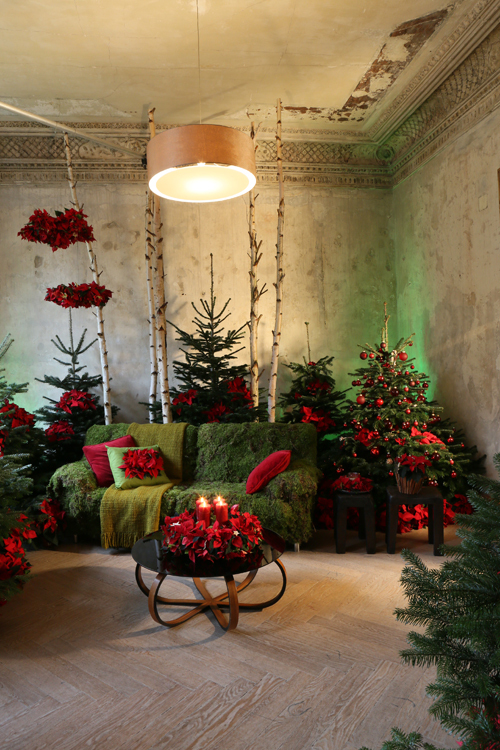 Well, the reason for my visit was to attend a Poinsettia Press Event, organised by Stars for Europe. The event itself took place in a fabulous old house and each room was themed around a particular fairy tale…Sleeping Beauty, Snow White and Little Red Riding Hood. The picture above and immediately below are from the Sleeping Beauty installation, which was definitely my favourite! 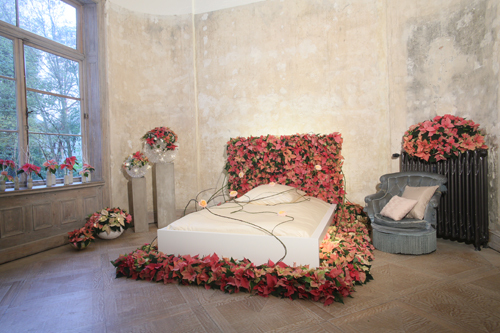 I loved the floral adorned headboard and carpet, in varying shades of pink, cream and red poinsettias. There were also lovely vases made from concrete, arranged on the window ledge. In the Snow White inspired room, there was a festively decorated table, with seven chairs…one for each dwarf. 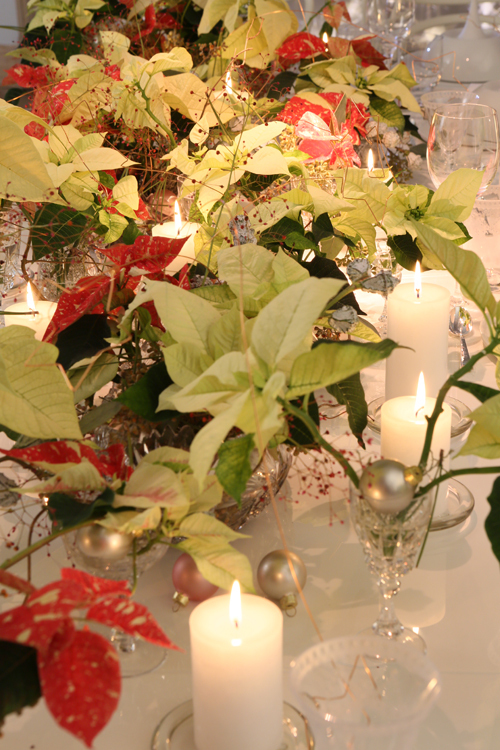 Red and white poinsettias had been beautifully arranged with Christmas baubles down the centre of the table. 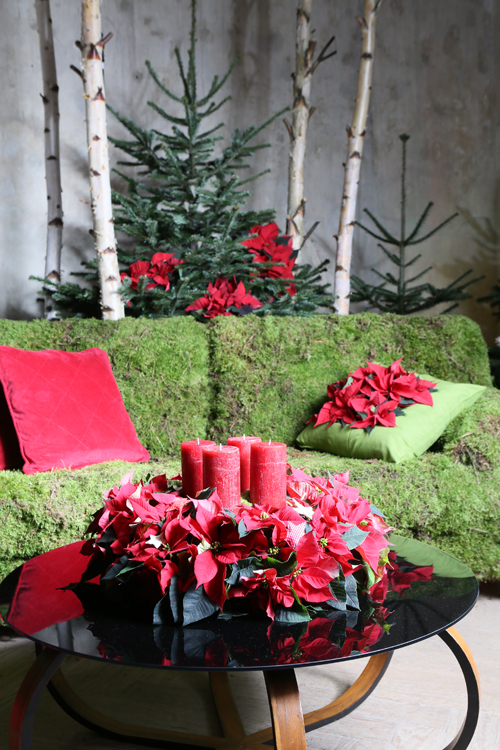 And finally, in the Little Red Riding Hood room, there was a wonderful sofa made of moss, with poinsettia cushions. 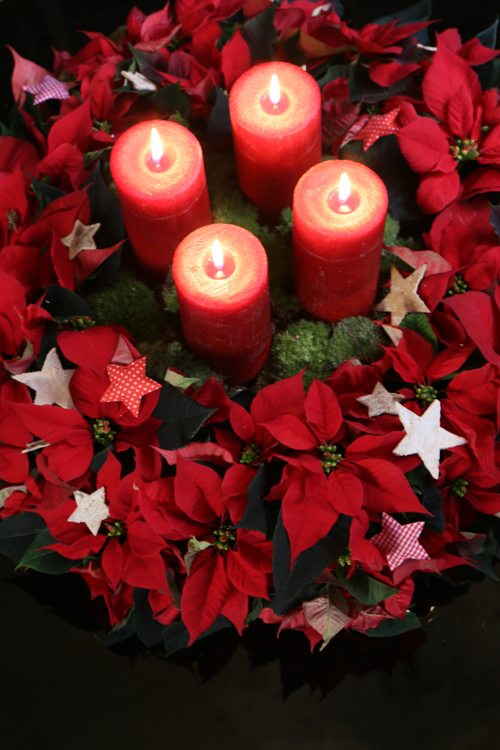 Plus, there was a stunning wreath of poinsettias with red pillar candles. Here’s a very short video, which I took at the event. 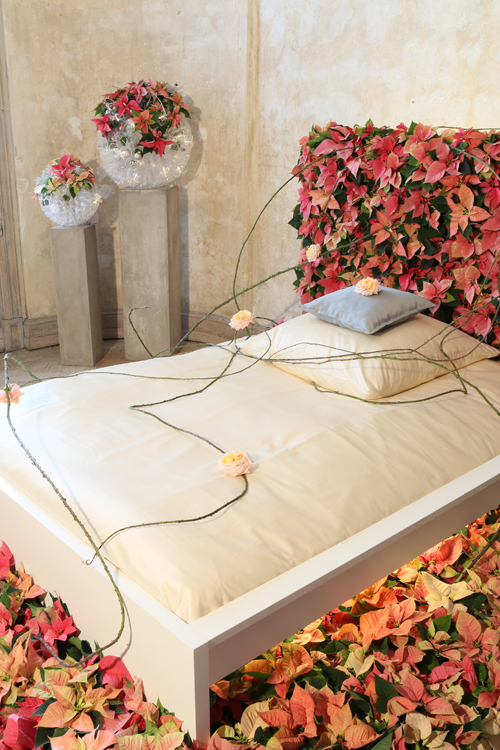 Many congratulations to German floral designers, Bjorn Kroner and Ilka Siedenburg, for creating such stunning room sets! 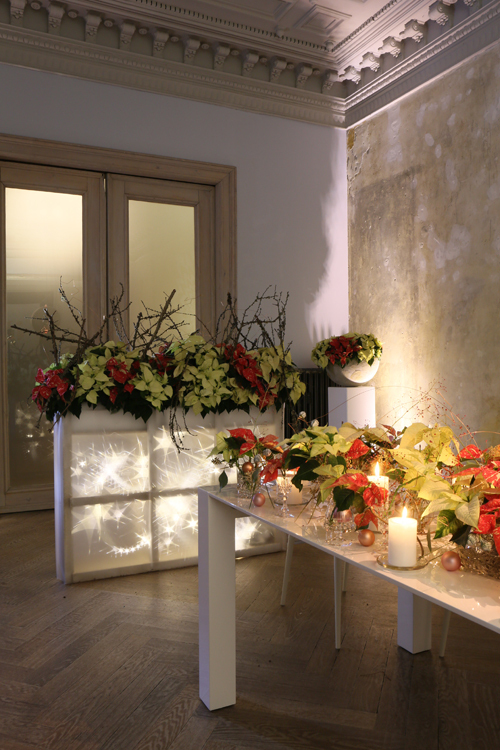 You may have noticed that lots of the poinsettias they used were cut flowers, as opposed to plants? 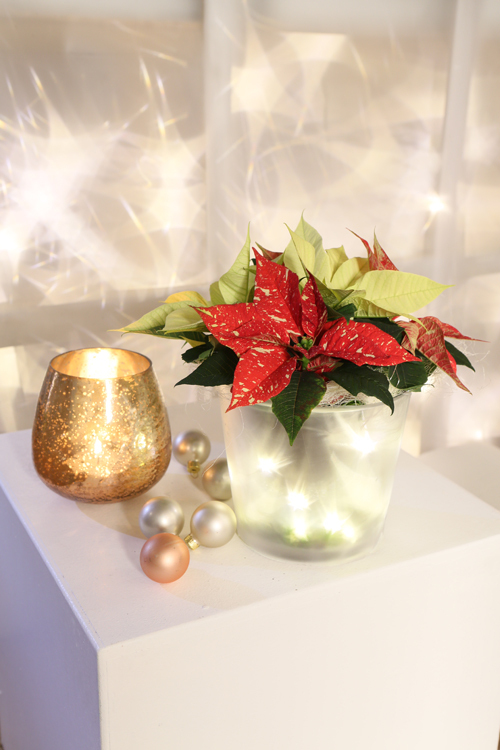 To use poinsettias as cut flowers, briefly dip their cut stem into hot water to seal the end. They should then last for about two weeks. And did you also see that there are other colours apart from red? 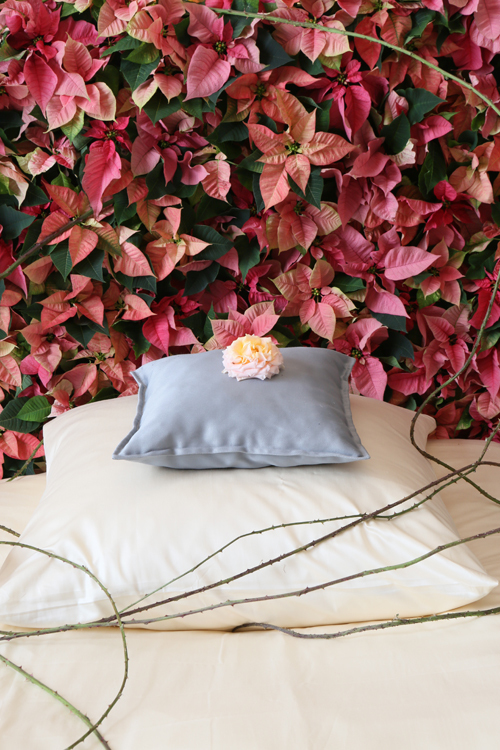 You’ll find poinsettias available in white, salmon pink, cream, apricot and bright pink. 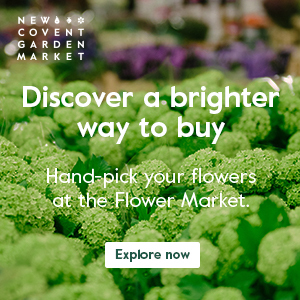 Keep it in a well-lit, warm place…ideally around 20 degrees Celsius. Protect it from direct sunlight and cold draughts. Water regularly, but sparingly, with lukewarm water. Feed once a month with liquid fertiliser. Thank you so much to Caroline and Hannah from Purple Spotted Media for inviting me to the event! 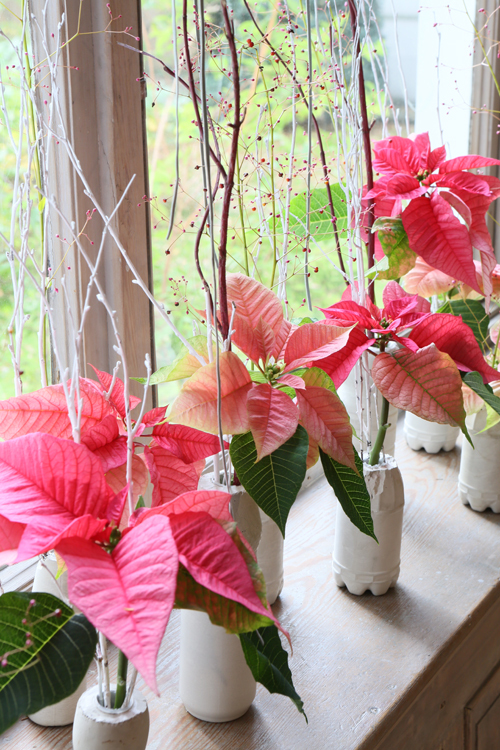 It was lovely to see Bjorn and Ilka’s inspirational poinsettia installations, plus meet up with press from around Europe, including fellow flower bloggers, Dana Frigero from Italy and Minna Mercke Schmidt from Sweden. P.S. 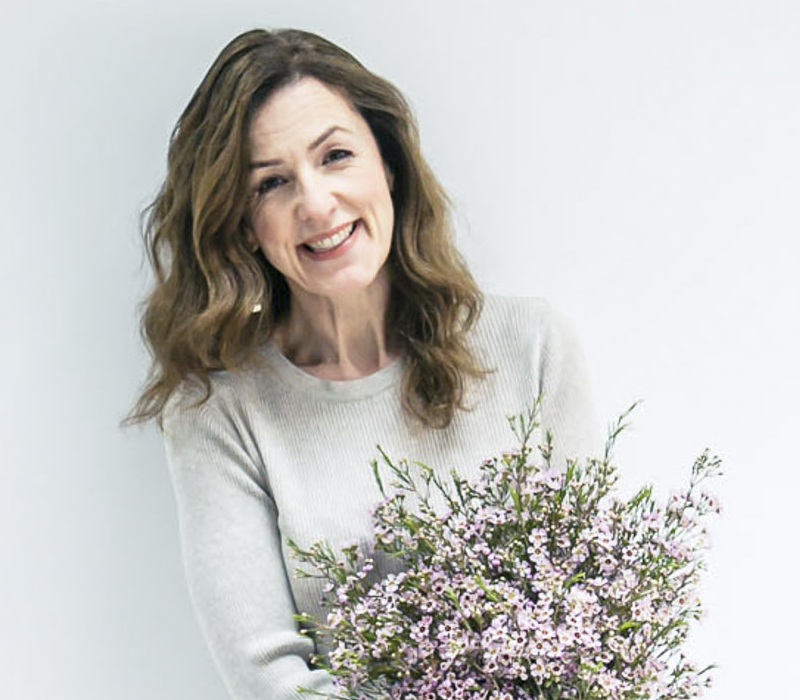 If you’d like to see a video featuring some of the German florist shops which I visited whilst I was there, click here.